The Last of the Minor Prophets. The Book of Malachi is the last of the Minor Prophets and the last book in the Old Testament scriptures, both in terms of reading order and date of origin. The book very fittingly concludes by pointing forward to a time when Elijah will return to prepare the way for the Lord (Mal. 4:5-6). The Rise of Greek Culture. At this point, the "word of the Lord" in written form goes silent. But time marches on. About 100 years after Malachi, the Medeo-Persian Empire (including the land of Canaan) eventually falls to Alexander the Great around 330 B.C.. After the death of Alexander the Great, two major Grecian factions dominate the eastern Mediterranean, the Ptolemies and the Seleucids. Due to the rising popularity of the Greek language among Jews, the Old Testament was translated into Greek around 250 B.C. (i.e. the Septuagint translation). 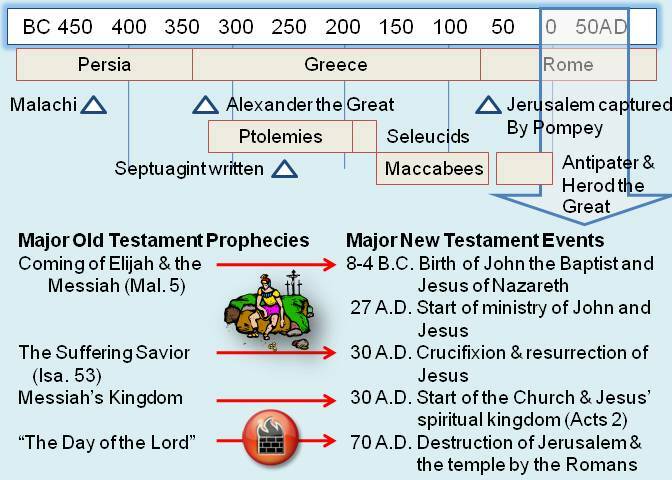 The Jewish Maccabees staged their revolt against pagan Seleucid influences beginning around 165 B.C., resulting in a rededication of the temple in 164 B.C. and the institution of Hanukah or the Festival of Lights. The Rise of the Roman Empire. Eventually the Grecian Empire falls to yet another dominating people, the Romans from Italy, with the land of Canaan falling under their influence around 65 B.C. With the arrival of the Roman Empire comes increased commerce, travel, and exchange of ideas. It also brings a string of Roman governors, beginning with Antipater and his son, Herod the Great. Elijah Returns. Between roughly 8 and 4 B.C., two children are born whose lives will usher in a whole new era. The first of these is John, son of Zachariah and Elizabeth (Luke 1). As a young adult, he will become known as "John the Baptist". After almost 460 years, he will fulfill Malachi's final prophesy regarding Elijah's return to prepare the way of the Lord (Luke 1:17 and Matt. 11:14). Eventually, he is beheaded by Herod Antipas (son of Herod the Great). In the Fullness of Time (Gal. 4:4). The second child is Jesus, son of Mary and Joseph (Matt. 1-2). After escaping death at the command of Herod the Great, He will grow up to have many designations, including "Jesus of Nazareth", "the Son of Man", "Savior", and the "Son of God". But from the perspective of the Minor Prophets, He will be the fulfillment of all their prophecies regarding a coming Messiah, Prophet, Priest, and King over His Kingdom. Another frequent prophecy and warning in the Minor Prophets was "the Day of the Lord". This will at least be partially fulfillment within 40 years of Jesus' time (Matt. 24) in the destruction of Jerusalem and the massacre or enslavement of a large part of the Jewish population by the Romans in 70 A.D. This included the destruction of the temple previously built by Zerubbabel almost 600 years before and greatly enlarged by Herod the Great around 20 B.C. From a spiritual perspective, this reflects God's judgment on the Jewish people for their rejection of the Messiah (Matt. 23:34-38).